Erika Lefevre of Rollyview, Mrs. Newman, Social Studies teacher and Pearl Gregor pose with Yardley Jones and the 2013 Fundraising Calendar. New Sarepta, Leduc County – Sometime in the early ‘60s, painter and Edmonton Journal cartoonist Yardley Jones ‘discovered’ New Sarepta by accident. Charmed by this little Village, he began featuring it in his weekly cartoons, creating a fame that endures today. Even as a young dad, Yardley Jones was interested in fitness. Yardley Jones, “New Sarepta’s Honorary Mayor”, was the instigator of this historic walk when he reacted to a challenge thrown forth by the US president, John F. Kennedy, who publicly stated that “our American soldiers should be able to walk 50 miles in less than 20 hours”. The nation responded to this challenge with enthusiasm, and the fitness fever traveled north of the border into Canada. Erika (Wanke) Lefevre is now a long-time Rollyview resident. After a few years away, she came back to her roots and is known to be an active and fit lady. Her husband shares her love of walking and running and often joins her in her daily walking and occasional races. On Friday, May 30th at 10am, the Hamlet of New Sarepta and Leduc County celebrated the 50 year mark of this Historic Walk, and created a smaller version of this event enlisting the enthusiasm and cooperation of the combined student populations of New Sarepta’s Elementary and Junior/High Schools. Fifty years later, the enthusiasm for this fitness challenge has not diminished… In the High School gymnasium, in a gathering emceed by Mrs. Kristen Newman, the High School Social Studies teacher, all the local children and youths are listening to testimonies of this historic date, and offering their own timely contributions. Erika Lefevre and Yardley Jones, the globally-renowned political cartoonist of Edmonton Journal fame, took the podium together and told the story of this walk’s origins; with humor and gusto, they recalled the hoopla that surrounded this event, including a helicopter that brought Yardley to New Sarepta that day, and took a few students for a quick tour in the air. The Flying Tiger (chopper) was proudly owned by CJCA, a hugely popular radio station of the era. Yardley Jones is dynamic, slim and humorous, and walks with a slight gait, due to a recent knee replacement. Erika Lefevre is a short dynamo, cheerful and friendly and happy to share her love of fitness and stories with others. At this presentation, the audience was also entertained by a performance by the “New Sarepta Philharmonic Choir” of a song written to honor The Walk. Hillary Sadler, daughter of Yardley Jones, now living in Markham Ontario, remembers how her dad was a boxer, a mountain climber and champion rope skipper, a hard-working father who only started running marathons and “ultra-marathons” when he was over 50 years old. After the indoor presentation of this reminder of a Historic Walk set in 1963, children, teachers and local dignitaries including Erika Lefevre and Yardley Jones, walked from the New Sarepta Community High School to Highway 21 and back – a 2.2 Km trek-, to enjoy a delicious BBQ lunch, served by a dynamic group of Social Studies students. It was inspiring to see older students walking with friends and younger siblings, interacting joyfully with teachers and both New Sarepta school principals! A high school student took her hosting duties seriously, baking and donating 400 cupcakes, with the help of her mom and girlfriends. Jade Botting was proud of their accomplishment, and humbly accepted compliments. On Saturday June 1st, New Sarepta’s AG Society was hosting its Annual Fair and Parade. On this day the Hamlet and Leduc County official had planned an Official Walk to honor those who completed the 50 Mile Walk, fifty years ago… Michael Trempner, former mayor of the Village of New Sarepta, represented the Hamlet as his dad Marvin Trempner was the Mayor of New Sarepta at the time (1963) and greeted the gathered walkers and supporters with warmth and humor, on the steps of the New Sarepta Tire & Girdle Co. shop, “owned” by Yardley Jones. Humorous greetings were offered by Nick Lees, the popular Edmonton Journal columnist, Yardley Jones’ friend and former colleague. Leduc-Beaumont MLA George Rogers was “thrilled to be a part of this event celebrating fitness”: Leduc County Parks and Recreation Director Dean Honesty was also a dynamic host, and happy of the turnout on this special day. Mr Benoit shared with enthusiasm that “he remembers the success of the 1970s ParticipAction Campaign and how it invigorated the fitness mentality of Canadians: when he works in Ottawa, he has a 30-minute walk to reach the Parliament (one way), and I enjoy that daily exercise.” Tackling family duties, Mr. Benoit and his wife are now Sherwood Park residents, and he proudly cited his country roots near Manville and Lloydminster. At the launch of The Walk on that sunny Saturday morning, following six members of the Edmonton & District Grade Four Pipe Band, the crowd walked at a good pace to the Zion Church, where a breakfast was prepared and served by church members who plan activities for New Sarepta’s youth all year long. Coordinated by Wendy Gowing, the Silent Auction was full of interesting and quality items, a credit to the generosity of local and regional supporters of Christian-based youth activities. Kerry Nisbet, along with three friends and supporters of the Cause, was a part of the Saturday morning Relay Walk that left New Sarepta in mid-morning: he is a founding member of the Edmonton IronTeam (formerly called the Iron Cops Team) competing at the Iron Man Canada Triathlon Challenge in Penticton BC, to raise awareness and funds for Cops For Cancer. Kerry is a passionate crusader of the fight against Cancer, a hockey coach, a tri-athlete and a board member of several Edmonton area charities who has relentlessly recruited Iron Man participants since 1998, starting with 10 recruits in 2000 and now having 100 signed-up triathlon athletes on record! IRONMAN Team so far has raised more than $5 Million for Cancer research. On this weekend, another milestone was celebrated: the Class of 1963 hosted a 50-year reunion that involved nearly forty guests who were Grades 9-12 students that year, former classmates and their spouses. 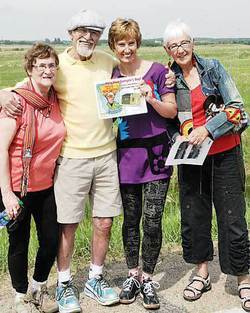 Dennis Litke, a lifetime resident of New Sarepta, was one of the four organizers of this action-packed week-end along with Marlene (Soch-) McAmmond, sharing memories and celebrating friendship. After the breakfast, one of the relay teams left to head out to Camrose to help with reaching the 50 miles total (as New Sarepta to Edmonton is less than 50 miles). The rest of the 50 Mile walkers traveled through Sherwood Park to finally head towards Edmonton. Wayne Schultz, president of the New Sarepta Historical Society and a graduate of the Class of ’63, drove into Edmonton and joined the walkers as they covered the last four blocks to arrive at City Hall at 4pm, where they were greeted warmly by Edmonton Mayor Stephen Mandel and a group of cheering friends and family. The “50 Mile Walk, 50 Years later” celebration was an event that New Sarepta and the region will not soon forget. Those who planned, participated in or simply witnessed this celebration can keep this exciting memory in their hearts, and hopefully this simple report will inspire others. Well done, New Sarepta and Leduc County! A Note: The New Sarepta Historical Society is currently hosting a large fundraiser: it has designed and produced an attractive Yardley Jones Calendar: the proceeds of this fundraising Calendar are to help fund the digitization of New Sarepta’s archives, to help create a Founders’ Memorial Wall at the Agriplex, and to print some black & white photos for the new Seniors Complex. Enquiries can be made to Leduc County regarding this fundraiser and the calendars.